The Middle East has the greatest oil reservoirs in the world. But, having created immense wealth, oil has not brought universal happiness to the region. The history of oil is about not only the great discoveries but the transformation of people and societies, the empires built on oil and the anarchies it has engendered. 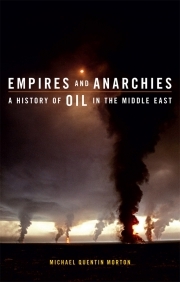 From the first explorers trudging through the desert wastes to the excesses of the Peacock Throne and the high stakes of OPEC, the burnt-out remains of Saddam Hussein’s armies and the human tragedy of the Arab Spring, Empires and Anarchies describes the history of oil in all its aspects: how it enriched and fractured the Middle East, eroding traditional ways of life and facilitating the rise of Islamic radicalism. Michael Quentin Morton’s account presents a fascinating insight into the historical background of the region through the people and politics of oil. It is essential reading for anyone intrigued by the promise and the curse of oil, as well as for those interested in how oil has played a crucial part in shaping the modern Middle East.